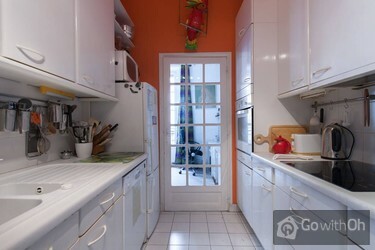 Apartment in the center of Paris close to the Panthéon. 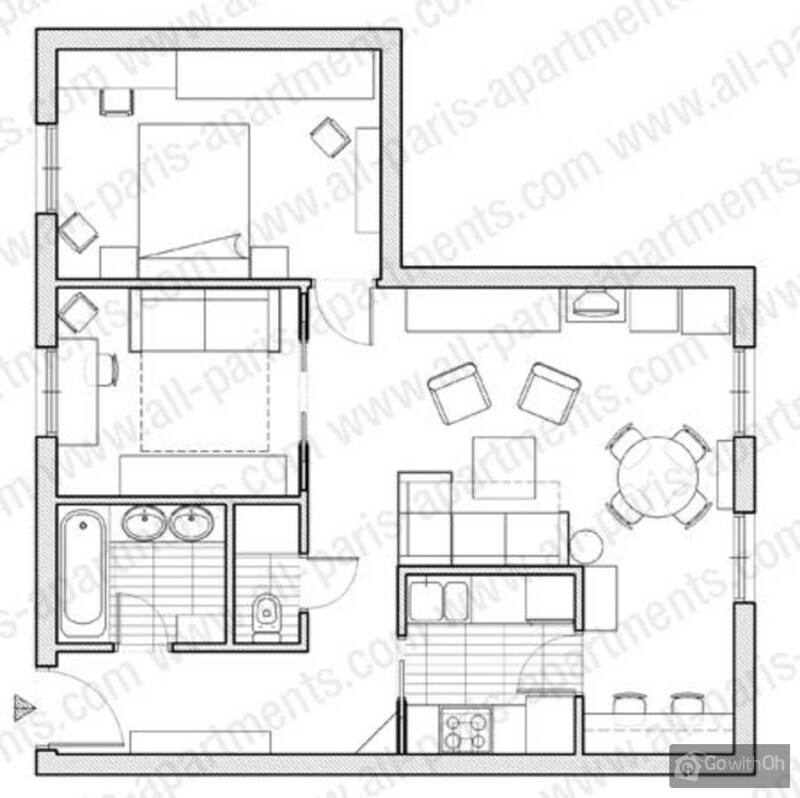 The apartment is ideally located in the 5th district in the center of Paris, and was totally renovated in 2004. It is very charming becouse of his rooms pieces dekoreted with the furniture in the style of Louis XVI. 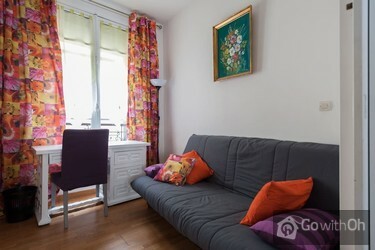 This nice 70 qm apartment consists of a living room, two bedrooms equiped with a double bed each, a totally equipped kitchen to prepare your lunch at home after a long day of visits in Paris, a bathroom and of an additionnal toilet. It is ideal for four people, two couples or a family, however there is a fifth place for a child to sleep in the sofa bed in the living room of this apartment. The apartment offers numerous options such as cable TV, central heating with convectors, broadband access to internet and a free phone to call in Paris and surroundings. 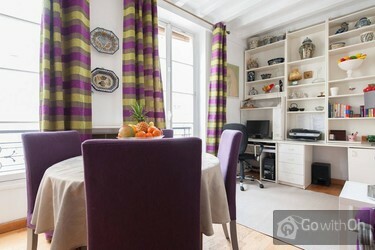 This apartment, is located in the center of Paris, in the street Mouffetard, which very close to Panthéon, Jardin des Plantes and the Jardin du Luxembourg. In the street Mouffetard, there is a all day market, little shops and bars and cafes. From the metro station Cencier Daubanton which is only a few minutes walking from the apartment, you will be able to head North of Paris through Chatelet, near Notre Dame de Paris, the Cité and the river Seine and its sightseeing boats, as well as the museum Louvres, Opera or porte de la Villette and the schemer structure of "the Géode". Check in until 22:00h. After 22:00, extra charge of 30. It wasn't very clean... For the rest is was absolutely perfect!!! Lage einfach perfekt . Sehr schönes Wohnzimmer, praktische, wenn auch kleine Küche. Ordentliches Bad mit zwei Waschtischen. Zweites Schlafzimmer sehr klein, nur Ausziehcouch und nur durch Schiebetür abgetrennt. Elternbett sehr hart. Austattung war sehr vollständig, da die Wohnung offenbar ...generell als Privatwohnung verwendet wird, die zeitweise vermietet wird. Internetverbindung hat sehr gut funktioniert. bien situado y tranquilo. la limpieza al entrar un poco deficiente y la cama principal incomoda por colchon viejo, por lo demás todo muy bien. A much recommended apartment in a prime location. The owners are very friendly and accommodating. It mets our expectations. Our apartment was in an excellent position, and was very homely. Metro transport was nearby. As non-French speakers we had some difficulty using the washing machine and stove but quickly learned by practice. We had enjoyable holiday and would seek to use this apartment if we travel to Paris again in the future. Un bell'appartamento, ben servito e attrezzatissimo in una zona centrale, tra l'altro vicinissima alla fermata della metro. La persona di contatto si è mostrata estremamente disponibile e gentile. 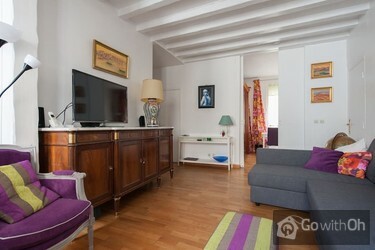 the apartment is very nice, and right at the centre of Paris. we had a very good time there. 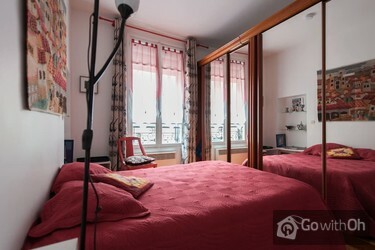 Excellent apartment - perfect location - enjoyed the convenience of Rue Mouffetard - great food and restaurent night life - would like to rent again in several years - please pass on our appreciation to Msr R. and his wife. Superbe appartement, très calme, dans l'une des rues les plus agréables de Paris. Idéal pour profiter de Paris. Accommodation good and in line with description, location excellent (three minutes from metro, wonderful pedestrian street with mouth watering shops and delicatessen). Could sleep 5 adults if sofa bed in living room used for two persons, big enough size. Our little dog was no problem at all. But in ...all of Paris dogs must be kept on a leash, even in parks. Reception by the contact lady okay, but no one turned up at the end to return the keys to and return the deposit. I trust this will soon be settled by bank transfer. I sent the owners an e-mail about this. The owners were very friendly people in the previous e-mail contact, they themselves were on holiday when we arrived. Wohnung kann ohne Einschränkung empfohlen werden. Lage optimal. Alle notwendigen Läden sind in ein paar Schritten zu erreichen. Schlafzimmer auf der Rückseite und damit sehr ruhig. Sehr sauber. We could not have been happier with this apartment. 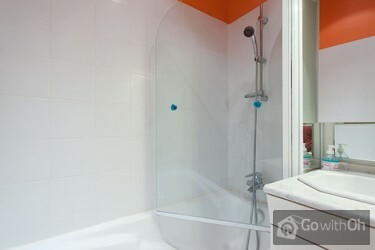 It is very well appointed and located on a particularly nice street. The owner was extremely helpful throughout. We hope to stay at this apartment again if travelling to Paris in the future. Highly recommended if you want an authentic Paris experience. Un vrai appartement où on se sent véritablement chez soi (les propriétaires y habitent quand il n'est pas loué) et admirablement situé : sur la rue Mouffetard, mais dans la partie piétonnière (le marché), dont peu bruyante. 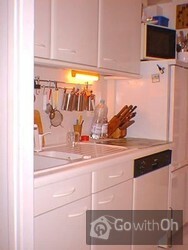 Matelats confortables, tout le nécessaire pour faire la cuisine, ...beaucoup d'espace (pour un appart parisien! ), un ordi sur place (avec imprimante : indispensable pour imprimer des billets achetés sur Internet), des chambres qui donnent sur une ruelle piétonnière, une décoration chaleureuse, une télé qui fonctionne vite et bien, un téléphone qui permet d'appeler sans frais dans de nombreux pays, une rue où on peut tout acheter pour se faire à manger... Bref, tellement typique qu'on a l'impression d'être dans un film, tout en étant bien plus confortable que dans un décor! Si vous cherchez un lieu aseptisé et neuf comme une chambre d'hôtel, cela ne vous conviendra pas. Mais si vous voulez avoir l'illusion d'être parisien, c'est idéal. Très efficace et rapide : très apprécié quand on réserve par Internet depuis l'Amérique du Nord. Tolle Lage, gute Ausstattung. Empfehlenswert. The place and appartment are fantastic! We have stayed there for 8 days. Gorgeous! Pictures and description completely reflets the reality. Comfortable, clean, easy to find, just over the restaurant. No noise or any special smells. Quiet and safe. All the cleaning stuff is included if needed. The ...view to the narrow bright street is sweet. The metro is really near and every Wednesday, Friday and Sunday there is real marche francais open, where you cheaply buy delicious food. Wish the owner and the neighbours a long happy life! Apartment was very comfortable with everything we needed. 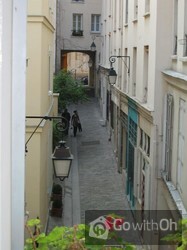 Its location on picturesque Rue Moufffetard provided many shops and restaurants and close transport links. There were some humorous moments when my school-girl French was undecipherable to our non-English speaking contact. Likewise my ...understanding of full-blown French was limited. But we managed and laughed about it. The apartment very nicely decorated and very well equipped ( although there was no DVD nor CD player which were mentioned in the description). But there was a computer with an internet access and a printer which enabled us to check in by internet for our return flight. Very nice and spacious ...sitting room and very well equipped kitchen. One of the bedrooms OK ( rather small but comfortable) enough space in the wardrobe, but the other bedroom was a kind of a problem as it was furnished with a sofa bed which was not very comfortable - it folded down if someone was not careful and moved to its edge. Also the door which separated the bedroom with a sofa bed was difficult to slide and made a lot of noise. Very good supply of bed linen and of good quality, even orthopedic pillows were available. The apartment is located in a busy street - but not noisy as there is only pedestrian traffic. Smell from the restaurant downstairs was sort of a nuisance. The entrance to the building and the staircase are rather dark and smelly. 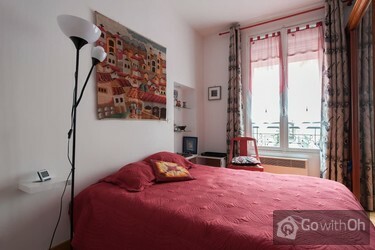 But the apartment was very clean and nice - very conveniently located - 5 minutes to the metro. The river and other places of interest are within a walking distance. We haven't met the owners of the apartment but they sent us a very nice e mail explaining who was in charge of the keys and who in case of any problems to contact. I spoke on the phone to the landlady and was given the phone number in case we wanted to contact them directly if there were any problems. I would recommend the apartment for a couple one . This appartment was perfect for us. It served us very well from a practical point of view, was in a great location with metro, shops and restaurants all very close by, and provided a charming, comfortable and genuinely French ambiance. It was surprisingly quiet for its situation. The owner and ...the person looking after the flat in his absence were very helpful, and it was a real advantage that we could take the flat from any day of the week, as Saturday flights get so booked up. We hope when we next have a holiday in Paris we will be able to return to the same accomodation. La calle donde está situado el alojamiento es muy agradable, con múltiples servicios. La entrada se hace por un callejón que al principio te predispone desfavorablemente pero el alojamiento está bien y tiene todo el equipamiento que se anuncia. La persona de contacto es encantadora. 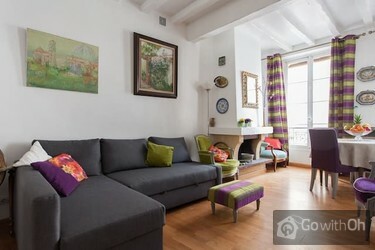 This apartment on rue Mouffetard is wonderful. I stayed there with my family of five for eight nights and we were very happy. There was ample space for us. The apartment is lovely. The kitchen is perfectly appointed with all the dishes and appliances you could need. The apartment is ideally ...located. The owners were very pleasant to deal with as well. Note that there is a restaurant below so you can smell cooking at night. It is not unpleasant, just evident. Overall, this was an excellent place and I would recommend it to all. Nice accommodation in an excellent area. Contact person polite, although an alternative contact person for our arrival and departure who had very limited english. Roomy, clean and very comfortable! Great location and atmosphere! Easy walk to the Seine river and various sights, such as the Pantheon, Jardin des Plantes, Jardin Luxembourg and the Austerlitz railway station. Just a few minutes walk from the Censier metro stop. Would stay there again. Can highly recommend it! The situation was very good and so close to many restaurants and shops. The apartment itself was most comfortable with everything you could possibly want. My friends and I were very happy with our stay there. L'appartamento e' situato in un quartiere vivace, comodo per gli spostamenti e ben servito da negozi di ogni genere. La casa e' dotata di elettrodomestici, stoviglie e utensili vari che la rendono accogliente e vivibile. Consigliato particolarmente ad una famiglia con due bambini. Lappartamento è in ottima posizione e vicino alla Metropolitane, silenzioso e comodo per 4 persone, le foto dellappartamento non corrispondono alla realtà, larredamento è molto più vecchio ed il bagno è in pessime condizioni. Ligging is leuk, in echte Frans straatje met bakker, etc voor de deur. Eettentjes in de straat, metro vlakbij. Appartement gezellig van alle gemakken voorzien. The apartment was the perfect on all respects. The street was vibrant but we were never disturbed by noise at any time. All the stall holders ,shop assistants and waiters were so helpfully. I would definitely return. The apartment was of a higher standard than any I have stayed in before in Paris. Best possible location in Paris -rue Mouffetard-best bread , cheese wine fruit and vegetables within view from the windows as well as restaurants Excellent reception and wonderful large apt great for four adults Only setback is that the matresses are too soft and uncomfortable except for the sofa in the living room. Un apartamento amplio y con todos los utensilios necesarios para tu estancia.